HomeFootballWhat Are Syracuse’s Chances Of Making a Bowl Game? Ahead of the season, most projected Syracuse to finish near the bottom of the ACC Coastal with just 4-5 overall wins. After starting the campaign 2-3, those prophecies looked destined to become truth. But after reeling off two straight wins, including last weekend’s 27-14 upset over the defending national champions Clemson, we are forced us to ask what the new ceiling of what Dino Baber’s Orange team is: a fourth straight season without late-December/early January football, a bowl trip to Orlando, El Paso, Louisiana, or—dare we say it—some place even greater? Just two more wins will get the Orange to the six required for bowl eligibility, however this is far from a gimme when looking at the road ahead. The remaining slate ranks 11th most difficult in the nation. The next task is a tall one in the form of a visit to Coral Gables to take on #8 Miami. Conducting upset magic inside the comfy confines of the Carrier Dome is one thing, but being asked to conjure it up again on the road is a big ask. The Canes (5-0) are the ACC’s only remaining undefeated team and boast one of the best rushing attacks in the nation. 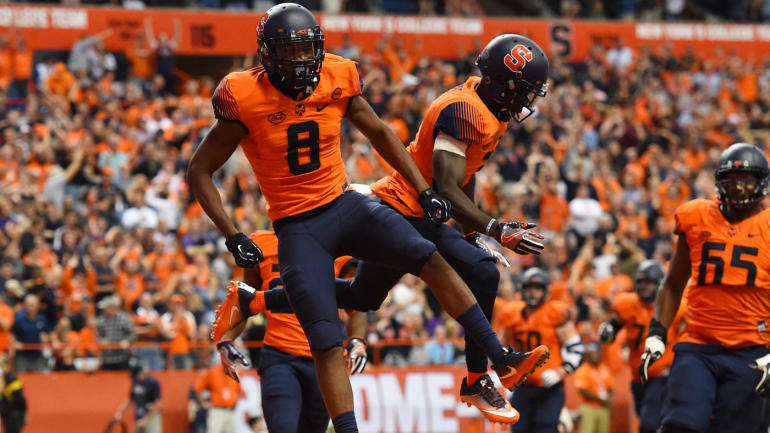 Following a bye week, Syracuse returns to Florida, this time to take on FSU in Tallahassee. Saying the Seminoles’ season has not gone as planned is an understatement: ranked #3 in many pre-season polls, the loss of quarterback Deondre Francois during the season opener against Bama has turned national title dreams into ones of just being .500. That said, the trip to Doak Campbell Stadium is never an easy one and FSU’s 2-3 record is a little misleading about their quality, as all three losses have come against current top 20 teams. From there, the remaining schedule closes out with the current bottom three of the Coastal division: Wake Forest, at Louisville, and Boston College. Each of these is more than winnable in its own right, but none are cakewalks. After starting 4-0, Wake has come back to earth, losing to Florida State and Clemson in their two most recent games. The highlight of BC’s season has been outlasting Louisville 45-42 in a shootout, with their other wins coming against MAC schools. As for the Cards, that loss signaled further unraveling of their season and with FSU, Wake, and UVA on deck, they might not have much left to play for before hosting Syracuse on November 18. Although math suggests anything more than a mid-range bowl bid is a far-flung possibility (ESPN gives a <1% chance of winning out or the ACC), a first-ever conference title game appearance is still technically in play. Holding a potential a tie-breaking win over Clemson is huge, provided that current division leaders NC State drop at least two games. Left on the Wolfpack’s schedule is at Notre Dame, Clemson, at BC, at Wake, and home against UNC. Since they already beat Syracuse, NC State would have to drop at least two of these. The Orange in turn would need to win out to make an appearance Dec. 2 in Charlotte. 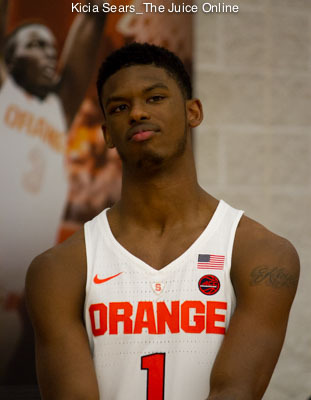 If both schools were to win out, Syracuse would find themselves be left out of a division title and championship game berth. If you’re a believer though, get in on the Orange now: at most online bookmakers and sports providers, like OnlineGambling.com, they are still priced at around +10000 to +15000 to lift the conference title. For this season, the ACC has ties to about 9-11 different bowls depending how the season plays out. Two possible destinations for six-win Syracuse squad could be Shreveport’s Independence Bowl against an SEC team or in Annapolis’ Armed Forces Bowl against an American Conference opponent. 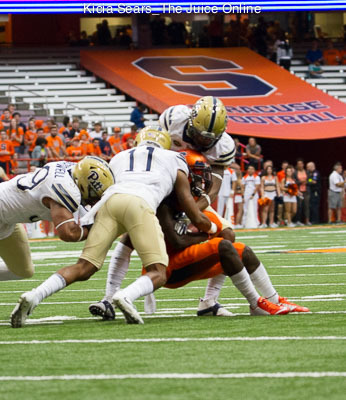 Seven or eight wins however could increase SU’s stock enough to yield an appearance at NYC’s Pinstripe Bowl against the Big Ten or the Sun Bowl in El Paso, also against an SEC team. Given that it doesn’t currently look like an ACC team will make it into the College Football Playoff (but never say never), a nine-win Syracuse season (without a title game berth) would likely send them to Orlando’s Camping World Bowl against the #2 or #3 Big 12 team. And this is entering jinx territory, but winning out the regular season and winning the conference championship to collect 10 wins for the first time since 2001, Syracuse would find themselves in the Orange Bowl for the first time since Donovan McNabb was under center. But for now, beat Miami.